Illyricum /ɪˈlɪrɨkəm/ was a Roman province that existed between 167 BC and 10 AD, named after conquered Illyria, stretching from the Drin river (in modern north Albania) to Istria (Croatia) in the west and to the Sava river (Bosnia and Herzegovina) in the north. Salona (near modern Split in Croatia) functioned as its capital. 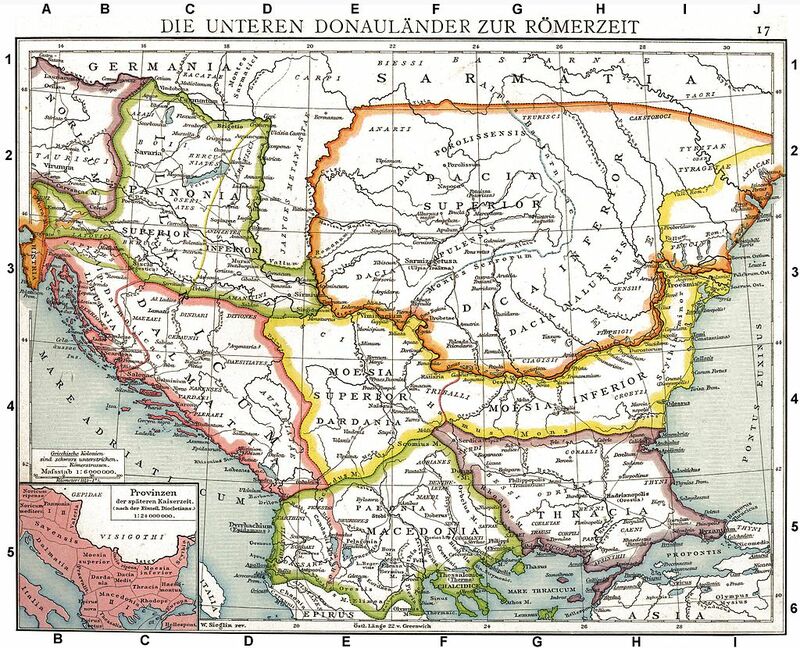 The province was then divided into Pannonia in the north and Dalmatia in the south. It stretched from the Drin  river in modern north Albania to Istria (Croatia) in the west and to the Sava river (Bosnia and Herzegovina) in the north. Salona (near modern Split in Croatia) functioned as its capital. The Roman Navy's first crossing of the Adriatic Sea in 229 BC involved Rome's first invasion of Illyria, the First Illyrian War. The Roman Republic finally completed the conquest of Illyria in 168 BC by defeating the army of the Illyrian king Gentius. From 167 BC, southern Illyria became a formally independent Roman protectorate. Roman provinceThe region had considerable strategic and economic importance for the Romans. It possessed a number of important commercial ports along its coastline, and had gold-mines in Dalmatia with an imperial bureau in Salona. Illyria also became the starting point of the Via Egnatia, the great Roman road that ran from Dyrrachium (modern Durrës in Albania), on the Adriatic, to Byzantium in the east. In 59 BC the Lex Vatinia assigned Illyricum (together with Cisalpine Gaul) as a provincia (zone of responsibility rather than a "province" as understood today) to Julius Caesar. The Roman administration did not establish a province until Octavian's wars in Illyricum in the period 35–33 BC. The first mention of the province of Illyricum occurs in the context of Augustan settlement of 27 BC, when it was assigned as a propraetorial province to imperial control. The Roman province of Illyricum comprised Dalmatia and Pannonia.As the Romans expanded their power in the region through a series of campaigns known as the Pannonian War or as the Pannonian wars (Bellum Pannonicum, 12–9 BC), fought against group of peoples known as the Pannonians, they enlarged the province of Illyricum. After crushing the Great Illyrian Revolt of Pannonians and Daesitiates subsequent to 10 (some scholars such as Jeno Fitz move this date to middle-late Claudian era c. 20–35), Roman administrators dissolved the province of Illyricum and divided its lands between the new provinces of Pannonia in the north and Dalmatia in the south. On the shore of Dalmatia Roman traders established themselves in a number of towns, Iader, Salona, Narona, Epidaurum. The capital Salona was protected by two military camps at Burnum and Delminium. In addition to the economic importance of Illyricum, it was a very valuable source of military personnel. From the 3rd to the 6th century the most useful troops were recruited from Illyricum (and Roman Thrace among others). Ronald Syme outlined the importance of Illyricum as the province that held the empire together. As a main recruiting ground, with armies ever present in its territory, it possessed a commander in-chief of the Illyrian army, the magister militum per Illyricum, based at Naissus. ​The term "Illyricum" continued to be used to refer to the western Balkan peninsula. Apostle Paul mentioned in his Epistle to the Romans that he was in this area to preach the "Gospel of Christ". In the mid-4th century, the praetorian prefecture of Illyricum was set up as one of four praetorian prefectures that the Roman Empire was divided into; it encompassed Pannonia, Noricum, Crete, and the whole Balkan peninsula except Thrace. The prefecture survived until the early 7th century. The region's native peoples, renowned for their military prowess, became an important source of manpower for the Roman army. Several notable Roman emperors came from the region, including Aurelian, Claudius II, Constantine I and Diocletian, as well as the Byzantine emperors Anastasius I and Justinian I. The regions which it included changed through the centuries though a great part of ancient Illyria remained part of Illyricum as a province while south Illyria became Epirus Nova, part of Roman Macedonia. Wilkes, J. J. The Illyrians, 1992, p. 120, ISBN 0-631-19807-5,Page 160,"... ' The Roman invasion of Illyria in 229 sc appears to have caught Teuta and the Illyrians completely off guard. As soon as the weather permitted, the queen had ordered south a naval expedition ..."
The Invasion of Europe by the Barbarians by J. B. Bury,2000,page 69,"... to his career after the death of his master. The importance of Illyricum did not lie in its revenues, but in its men. ..."